After years of singles, 2014 finally seemed like the year that Todd Terje would breakthrough as a genuine electronic artist with blockbuster beats set to take over the world. While, he's not quite on the same level as Avicii, David Guetta, or Calvin Harris, Terje has made a significant impact on dance music and indie-electronics. His debut record, It's Album Time, appeared on numerous best-of lists last year despite his live act being rather infrequent on American soil. In fact, aside from his appearance at Coachella, this was Terje's lone American performance of the year (well, so far). On a cold winter night, the Norwegian producer brought his flash and wonder to Brooklyn. 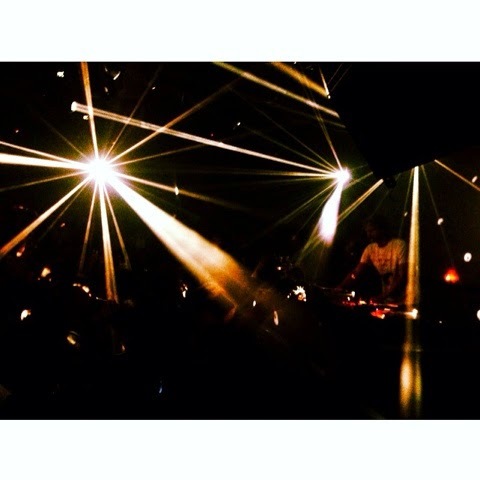 His deep grooves, pulsing synths, and stellar rhythms made the club a spectacle. Brilliant energy and relentless bass pushed the night into hypnotic trance of weighty beach influenced disco. It evoked the balmy ocean breezes and warmth, yet still brought the life out of a dark and cold New York City winter. Intoxicating and full of motion, motorik beats and Krauty-jams combined with his particular blend of techno set forth a glistening live set (his keyboard work was fantastic) that kept the crowd bouncing all night. He even ended his set with an exceptional remix of Whitney Houston's "I Wanna Dance with Somebody" that sent the night into overdrive. A glittery bath of strobes and neon helped cater to his unique style which seems to draw from a stellar range of influences. He's been critiqued in the past for making "background music for a beach bar" and while his pizazz can certainly lean towards lounge music, it should never be considered boring or simply background music. It's not the in your face intensity of the popular EDM mode, but if the next beach party I attend is anything like this, I'll seriously question someone who says they have a bad time at the beach.